The dishes of Teppanyaki are similar to Western-style meal. In Japan, Teppanyaki is considered as a Western cuisine. However, it is known as a Japanese-style cuisine in the United States because of the development process. 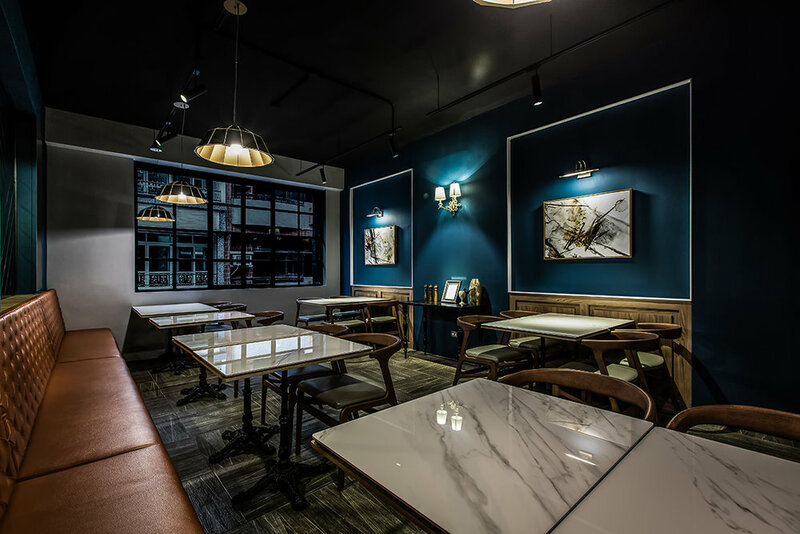 The idea of this project is based on the historical and cultural background of Teppanyaki itself, and the fusion of Japan and Western style is the centerpiece during the design phase. Black tone is clear and low-key. It shows extraordinarily modern and eye-catching in such a simple city. The surface of the tongue-and-groove plate on the outer wall of the building is uneven, and the light and shadow move along with the concave and convex surface during the day and night. Original stone column with close lightly pebble finish of the building is preserved. Using the iron screen separates from neighboring houses with courtesy. The windows of the automatic door are inlaid with glass and wood board. Warm wood mixes with cold metal and glazing glass. Heterogeneous elements create a sense of vogue. They are compatible and blur the boundaries of different materials. The interior gorgeous can be seen through it. The experience of consumer sensory starts with the atmosphere. Cement polish floor is put together with hexagonal marble brick. The distinctive art texture is presented by the Venetian plaster scratched wall. Long kitchen island combines with iron plate frying table. Italian marbled finish desktop is not only quality but also practical. The extraction pipe is exposed intentionally and looks like an installation art. Most of partitions and decorations are interlaced texture. Stair and handrail are serpentine and lead guests upstairs. The second floor dining area is spread with bold colors. Sofa’s color is based on the color of logo. The wall is matched with contrasting colors. It displays the visual impact but not strange. One wall is peace and quiet, and another wall is dynamic. Wooden floor and paintings continue interlace art style. The reflections of mirror create a sense of space. Cooking the fresh food on the hot iron plates brings a delicious meal. Enjoy the wonderful atmosphere of this dinning space.